This post has already been read 1841 times! UNK Dining Services donated 150 pounds of food to United Way of the Kearney area through its Project: Clean Plate program. Those participating in the recognition event Monday included, left to right: Scott Benson, Business and Finance; Alvin Mayes, executive chef; Shonna King, Dining Services; Lisa Reese Parish, United Way of the Kearney Area; Wil Smith, Dining Services; and Paul Plinske, UNK Athletics. KEARNEY – University of Nebraska at Kearney Dining Services donated 150 pounds of food Monday to United Way of the Kearney Area thanks to students’ efforts to reduce food waste on campus. 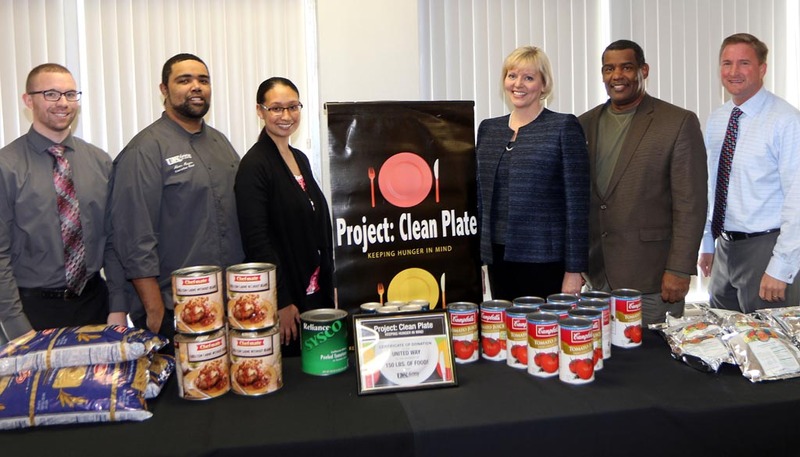 Dining Services and UNK Athletics partnered on Project: Clean Plate, which is in its fourth year. The goal of the program is to reduce food and liquid waste in the Market @ 27th Street, the dining hall in the Nebraskan Student Union. It also strives to raise awareness about poverty and fighting hunger. UNK Dining Services tracked how much food and liquid waste was thrown away during lunch and dinner at The Market @ 27th on campus to establish a baseline. For every pound of waste reduced between dates in October and November, UNK donated a pound of food to United Way. Lisa Reese Parish, executive director for United Way of the Kearney Area, accepted the donation during the Project: Clean Plate celebration on Monday. 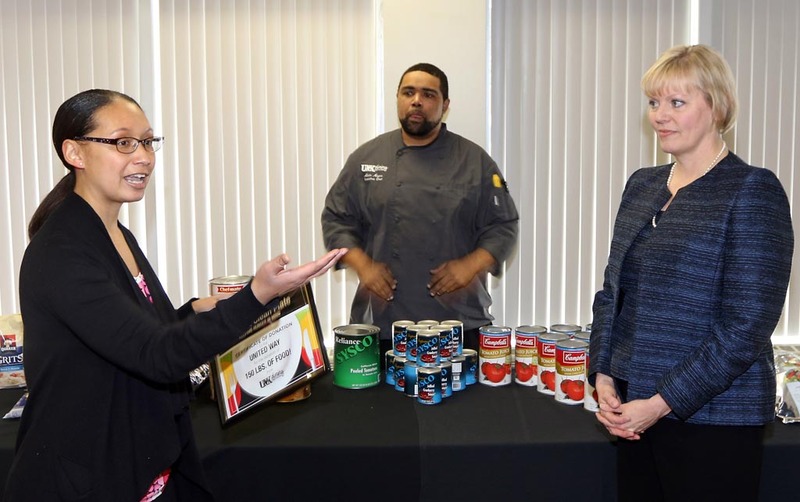 UNK Dining Services Marketing Manager Shonna King, left, presents 150 pounds of food to Lisa Reese Parish, executive director for United Way of the Kearney Area.